Among seabirds that could be affected by offshore wind turbines, Marbled Murrelets are a threatened species that are an important consideration for siting offshore West Coast wind energy developments. The federal Bureau of Ocean Energy Management (BOEM) is leading an effort to consider birds in their planning of wind energy development offshore from California, including three areas 25 to 50 miles off the coast of Humboldt Bay, Morro Bay, and Diablo Canyon – areas designated as having wind energy potential. 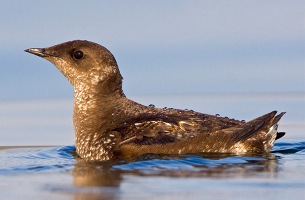 The American Bird Conservancy has provided additional considerations, including ways to minimize impacts in these areas to seabirds, such as Marbled Murrelets, a species listed as Threatened under the Endangered Species Act (ESA). As part of BOEM’s 100-day comment period, the American Bird Conservancy submitted a letter to help inform the planning process. The letter specifies concerns regarding potential adverse impacts of wind energy on birds, including Marbled Murrelets. The American Bird Conservancy (ABC) also recently wrote a letter voicing concerns over potential impacts on Marbled Murrelets from the proposed Skookumchuck Wind Energy Project in Washington state, suggesting improvements to that project’s draft Habitat Conservation Plan to avoid, minimize and offset any potential impacts to threatened Marbled Murrelets. * Having developers buy into a mitigation fund to support seabird conservation efforts and independent research on the vulnerability of birds to wind energy facilities off the California coast. * Using site-specific research and predictive mapping to determine whether there are any high-risk areas within the wind energy areas that should be excluded. This would help BOEM and developers carefully site wind energy facilities in locations that avoid bird “hotspots:” important foraging areas, migratory routes or other places where birds congregate. * Having developers implement avian monitoring and minimization plans that are subject to public review. ABC has made similar recommendations regarding wind energy off the coasts of Rhode Island and Massachusetts, to avoid impacts on populations of Roseate Terns, which are listed as Endangered under the ESA. Like other seabirds, this species faces threats from climate change and competition from commercial fisheries, in addition to offshore wind energy development. The American Bird Conservancy has also recommended that the California Intergovernmental Renewable Energy Task Force establish an avian stakeholder advisory group and a mitigation fund to offset bird losses. Such a group would help ensure that the public remains informed about research, and they would monitor impacts and offsets relating to bird conservation and wind energy development.